What Day Of The Week Is August 4? 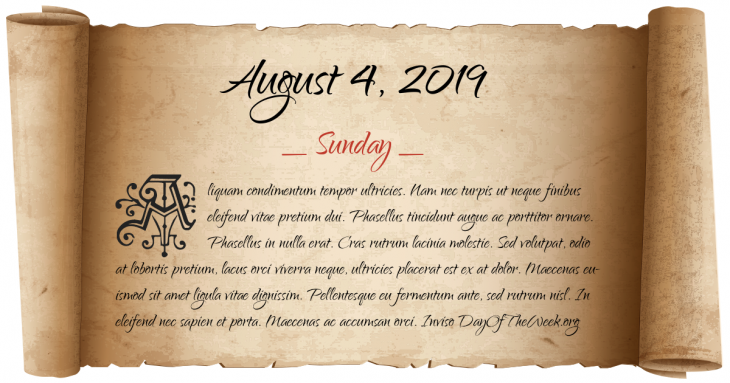 August 4, 2019 is the 216th day of the year 2019 in the Gregorian calendar. There are 149 days remaining until the end of the year. The day of the week is Sunday. Date traditionally ascribed to Dom Perignon’s invention of Champagne, although he actually did not have anything to do with sparkling wine. The Battle of Kos is fought between Turk and Greek forces. World War I: Germany invades Belgium. In response, the United Kingdom declares war on Germany. The United States declare their neutrality. Vietnam War: at the apartment of French intermediary Jean Sainteny in Paris, American representative Henry Kissinger and North Vietnamese representative Xuan Thuy begin secret peace negotiations. The negotiations will eventually fail. Licence to Kill goes on general cinema release in the United Kingdom. A massacre, is carried out by Sri Lankan government forces, killing 17 employees of the French INGO Action Against Hunger (known internationally as Action Contre la Faim, or ACF). Who were born on August 4?